Glue is most commonly used. Glue is crucial to laminate flooring and glue between the flooring pieces is the only thing that is keeping the floor together. Most manufacturers make their own glue--don’t substitutes or you may void your floor's warranty. In its original, unopened cartons, lay the flooring flat and leave it in the room where it will be installed for a least forty-eight hours before you install it. This is necessary in order to minimize dimensional changes in the installed floor. The room should have its normal living temperature. Read the instructions. When you clamp the boards together the glue must squeeze out of the joints. If it does not, then small gaps will develop between the planks as the glue dries. You know you're not putting in enough glue the minute that the job starts looking neat and tidy. You want glue to "sip over". Simply wipe off excess glue with a clean damp cloth. If plain water doesn't work, acetone will. Titebond® Tongue & Groove Flooring Glue is a premium wood glue that passes the stringent ANSI Type II water resistance test. In addition, it offers a lower chalk temperature and a two year shelf-life, both of which make it unique to the industry. Titebond Tongue & Groove Flooring Glue is specifically formulated for all types of laminate and floating floors, even over radiant heat systems. 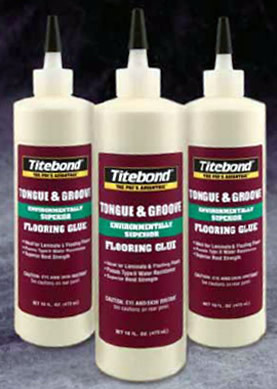 Titebond Tongue & Groove Flooring Glue provides a superior bond at the tongue and groove. Due to its white color, the glue is easy to see for quick cleanup. It is non-toxic and nonflammable, making it safe to use and environmentally friendly. Titebond Tongue & Groove Flooring Glue gives the professional installer the highest level of protection against potential moisture problems, while maintaining a strong ultimate bond. Storage life 2 years in tightly closed container at 75°F. Methods of Application Plastic bottles with fine tips. Installation Method Titebond Tongue & Groove Flooring Glue can be installed using the continuous bead method. When using this method, a water-resistant joint is created. Follow the flooring manufacturers’ directions for proper positioning of the adhesive bead. Some manufacturers prefer gluing the top of the tongue and others prefer gluing of the groove. Titebond Tongue & Groove Flooring Glue is the professional installer’s choice for either method. Titebond Tongue & Groove Flooring Glue passes Type II water-resistance tests. Do not use for joints below the waterline or continuous submersion. Do not use when temperature, glue or materials are below 55°F. KEEP FROM FREEZING. Freezing may not affect the function of the product but may cause it to thicken. Agitation should restore product to original form. Remove excess glue from surface while wet. Do not allow glue to dry as it will be difficult to remove. No caution information is needed. Please refer to the Material Safety Data Sheet for further information. When it comes to a combination of incredibly good looks, simplicity of installation, durability and price then there are few other flooring products that come close to laminate flooring. It has never been easier to fit a laminate floor, with manufacturers introducing quick and simple to assemble products. Even for people with limited DIY knowledge, which is another reason why so many people are choosing laminate for their homes. All laminate flooring packages come with easy to follow instructions and laminate kits and accessories can be bought which include everything you will need to lay your floor with ease. Laminate floor does not fix directly to the sub floor which means installation is very quick and you can walk on your new flooring straight away. Many of the laminate floors on the market simply click together, eliminating the need for the adhesives of the past, making laying laminate flooring a clean operation and by avoiding glue you can dismantle the flooring which means that should you move, your laminate flooring can move with you. The secret behind the ease of fitting laminate flooring is the simple locking system that allows each plank to simply click into place. The joins are virtually invisible and the planks can be lifted then reinstalled if you need to replace a damaged board. When laying a laminate floor you must consider what underlay will be best to use. By using thicker underlay the floor will have more insulation and better sound dampening properties. If a laminate floor is being laid on a concrete sub floor it is advisable to lay a damp proof membrane first to prevent moisture damaging the flooring. There is a growing number of laminate floors on the market that have built in underlay however a damp proof membrane is still recommended on concrete sub bases. Deciding on which direction to lay the laminate floor in is another consideration to make as it can be crucial to the look of the room. Most floors look best if they are laid in the direction that the sunlight enters the room whilst in hallways laying the laminate floor along the length of the space will give the best visual results. As well as the aesthetic benefits, top quality laminate flooring is renowned for its long lasting qualities. Boards are impact and wear resistant and high heals will not cause indentations. Spills can be removed with a damp cloth and cigarettes, dropped for only a few seconds will not leave any burn mark. Once installation is complete keeping your laminate floor looking clean and tidy is effortless. Laminated flooring can be swept or vacuumed whilst everyday marks can be wiped clean with a damp cloth. By using a doormat dirt can be kept at bay and scuff marks from pebbles and grit will be avoided keeping your laminate floor in a perfect condition. Laminate wood flooring can be used to add a natural and stylish finish to homes, shops and office spaces. With such a wide choice of laminate flooring available you can be guaranteed to find one that suits your taste and gives your room the stunning finish you are looking for.